Ireland’s newly appointed soccer manager Mick McCarthy was the guest speaker at the inaugural Association of Professional Motoring Press (APMP) Irish Motor Media Breakfast, which took place on 21 January 2019, where marketing and public relations personnel from the Irish motoring industry were invited along for an informal gathering, at the newly completed state-of-the-art Harris Group commercial vehicle showrooms on the Naas Road, Dublin. As 2019 automotive industry kicks into full swing, APMP took the opportunity to sit down with colleagues and friends to discuss the year ahead. 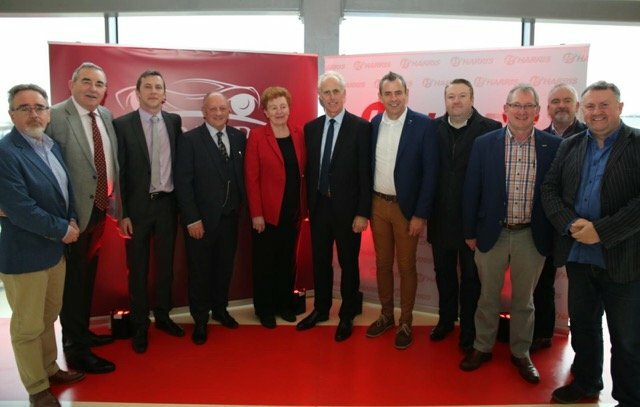 This event also allowed the Harris Group the unique opportunity to showcase its newly completed showrooms to the greater Irish motor industry. Guest of honour, Mick McCarthy, was pleased to have the opportunity to talk cars and football, two things which he is passionate about. As he embarks on the newest chapter of managing the Irish soccer team, Mick took time out of his hectic schedule to meet and speak with the attendees. Having fond memories of his first car, a Mini Clubman and progressing to a Ferrari 458, he has had many different types in between: “I am a serious motoring enthusiast and am delighted to talk to those who provide and those who write about the cars of tomorrow. I’ve always loved cars and driving and look forward to seeing and reading about all your new offerings in 2019,” he said. “As we face into a somewhat uncertain few months ahead, given the lack of progress with Brexit, the APMP is determined to ensure that the Irish motoring public remain informed as to what is available to them throughout the market. The APMP and its membership strive to continue to provide a professional and impartial view on all the vehicles they assess and drive and hope that potential buyers benefit from their expertise,” concluded Bob.